One of the advantages of being an independent financial adviser in London is that we investment IFA’s are regularly invited to seminars where the top fund managers will turn up and discuss their wares. I can’t attend all of them of course, but I do go to a fair number, carefully chosen. I was at Commerzbank recently, who were hosting Stewart Cowley, head of fixed income and manager of the Old Mutual Global Strategic Bond Fund, and John Ventre, a multi-asset manager with Skandia, covering Skandia Shield Fund, (a guaranteed fund with guarantees provided by Commerzbank) and Skandia Spectrum Funds. The theme was “Protecting Investors’ Assets” I won’t bore you with the details, but I did enjoy listening to both Stewart Cowley and John Ventre’s predictions. The one which hit home with me was one of John’s : never mind Greece, Ireland and Portugal: the Eurozone may have a serious wobble on the horizon as he expects Italy to get into difficulty at some point in the fairly near future due, inter alia, to inefficient tax collection and a massive public pension funding problem. Crikey – if Italy does a “ Greece” then the whole world economy is going to wobble, – seriously. As for protecting investors’ assets, (and admittedly Cowley was rather preaching to the converted in my case since I have recommended his fund to many clients over the years, particularly more recently), Cowley believes his fund will do well since it has the comparative freedom of taking positions in currencies, taking short positions, and other means of earning profits in a falling market. He also in his accompanying flyer, concluded that ” in bond terms a mixture of inflation linked government bonds, high yielding corporate bonds and inflation plus targeting absolute return funds will be the most likely solution to traditional asset liability matching”. If you are a client of mine reading this, then you probably heard something similar from me in early January this year. Of course one of the problems with such seminars is that the speakers almost invariably believe that now is a good time to be investing in their fund. A notable exception was Tom Dobell, the manager of the M & G Recovery Fund, who I remember seeing some years ago in the middle of the credit crisis and tumbling markets. There was much (rather exasperated) shaking of the head as he reviewed statistics and the current outlook at the time, and when asked how he thought his fund would perform over the next 12 months, actually replied that he did not expect to make any money at all and quite possibly a loss. Full marks to Tom for honesty, which is always refreshing. His fund is something of a market leader too. So where does this leave us all? Where should we be investing our money over the next five years? Well I think the general answer is that the need to diversify has never been greater, and that one must review the traditional asset allocation models and be prepared to take tactical positions against those models if need be in order to secure an efficient balanced portfolio in the current world economy. What does that mean? If you care about your money, get a professional involved. Most, like me, will take a preliminary look at what you have and discuss a possible better solution, without needing a commitment up front from you the client. Well it was off to the members’ lake in Wakering for me and young Andy last weekend, and we weren’t disappointed. Considering we are relative novices it looked like we chose better swims than those who were there when we arrived, who we could hear lamenting they weren’t getting much. We were soon into fish and landed a good number of fair carp, mostly mirror, in the 1lb to 2lb range. For me, having pulled plenty of smallish carp out from the middle, I tried my luck in the margins, a few feet out and 10 feet to the side, and was rewarded with one of my bigger fish. I don’t know what he weighed (I really must get a scale) but a guess would be 7lb-ish (?). Gave a good fight too. 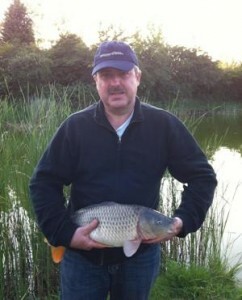 Both went home tired but happy (Andy not so happy as me as my fish trumped his – heh heh).